The Dominican tradition has its origin in the life and ministry of St Dominic de Guzman (1172-1221). His charismatic vision of a way of responding to the needs of the Church in the thirteenth century led to the establishment of the Order of Preachers, popularly known as the Dominicans. 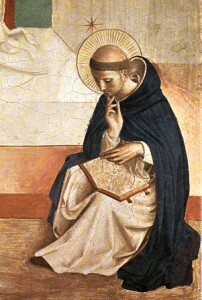 St Dominic completed his theological studies at Palencia in 1196 and became a Canon Regular, a member of a community of priests following the Rule of St Augustine. Pope Innocent III enlisted Dominic to be part of a preaching mission against the Albigensians. The nine years that he spent preaching served as the germinating period for the development of a charismatic vision of a way of living the Gospel in accordance with the Christian faith that would appeal to the deepest ideals and needs of the men and women of his time. During his early years of preaching, Dominic gathered a group Albigensian women whom he had converted to form the nucleus of the first community of Dominican nuns. Through a life of contemplative prayer, lived in a community dedicated to poverty and mutual service, these Dominican women would incarnate the apostolic life and preach the Gospel by their witness to prayer and service. Although the Order of Preachers did not have official status, the first community of Dominican women at Prouille in the South of France, the preaching nuns, initiated an evolutionary development in which countless women through the centuries would come in collaboration with their Dominican brothers to fully participate in and help to develop the life and ministry of the Order of Preachers, the Dominican Family. After the establishment of the Dominican nuns at Prouille, Dominic continued the implementation of his vision of communities of contemplative preachers living the apostolic life. In 1215, Dominic brought the men who were his preaching companions together to Toulouse, to establish a formal religious community. In 1216, Pope Honourius III, approved Dominic’s plan for an order of contemplative preachers exercising the priestly ministry and living in mendicant poverty. They owned no property except for the land on which their religious houses were built and they were to work or beg for their daily needs. In the final years of his life, Dominic transformed the friars living in Toulouse in the international Order of Preachers whose lives and ministry would impact history until the present. St Dominic believed that his followers should be afforded the best educational advantages possible. He had a keen awareness of the needs of his time which convinced him that a solid education for his Order would be the way to ensure the highest quality and effectiveness in his community’s preaching and apostolate.